Unhappy with the shape or size of your nose? 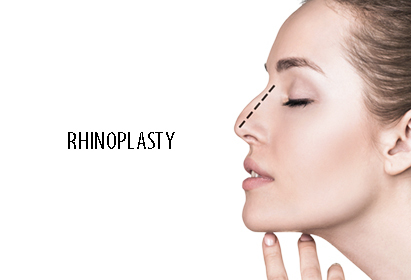 Rhinoplasty is a cosmetic surgical procedure that can correct & reconstruct the nose. This procedure can change the appearance of your nose with regard to shape, size & proportion. It can also correct defects & deformities & improve breathing. Can you fix a nose without surgery? A nose can be sharpend and shaped non surgically to a certain extent with the help of dermal fillers. however, for deformities, major symmetrical corrections & nasal issues, Rhinoplasty is the only solution. What can i expect to achieve from Rhinoplasty? The shape, size, proportion & symmetry of your nose can be changed. The results are permanent with no visible scarring. Rhinoplasty can change the size, shape, and angle of your nose and bring it into better proportion with the rest of your face. The results are permanent & you will be left with no visible scarring. What is the downtime or healing time for this surgery? The healing time for this procedure is approximately 10 to 14 days for major corrections wherein you can expect some bruising & swelling & in some cases; a sore throat. What is the procedure of Rhinoplasty? Depending on the corrections required it could be a major or minor surgery in which case general anaesthesia is administered for major corrections & local anaesthesia for a minor surgery. Surgical Incisions are made so that the cartilage & bone are accessed & are either added or removed depending on what is required to achieve the desired outcome. on reshaping of the nose, tissue & skin is draped back over the nose. A splint is placed on the outside to stabilize & support the new shape.